Two years ago I helped plant what was Surrey’s first new hop garden for more than half a century, and this week I went down and helped harvest hops from that same hop garden. Of course, “helped plant” is a wild and self-aggrandising exaggeration: I dug out and popped hop rootstock into fewer than a couple of dozen holes out of the two thousand in total that were made in the field opposite the Hogs Back Brewery’s premises in Tongham, near Farnham. And “helped harvest” is a terminological inexactitude of Melton Mowbray megapie proportions as well: I gathered maybe half a small plastic bag-full of fresh Farnham White Bine hop cones off the lower third or so of a couple of towering bines. 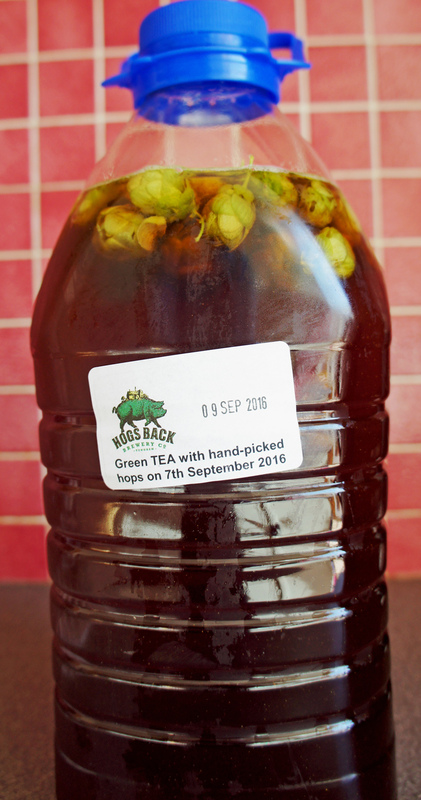 Still, those cones then went into some of Hogs Back’s TEA – Traditional English Ale – to make a new, or at least rare style of beer: Fresh Green Hopped Ale. And after a couple of days to mature, it tasted … well, let’s wait to the end. The hops Hogs Back planted in its own hop garden are Fuggles, Farnham White Bine, the traditional local hop, which disappeared from Surrey 80 and more years ago, and the American hop Cascade. As it happens, one of Cascade’s parents is Fuggles, so it ought to feel at home in England (though its ancestors also include, probably, American wild hops of unknown provenance, via open pollination, hence its very American citrus flavours.) According to Miles Chesterman, Hogs Back’s head brewer, the Surrey-grown Cascades (which go into the brewery’s Hogstar lager) are the equal to any Americans, and he is turning away offers to buy some of this year’s harvest: Hogs Back wants it all, especially at current prices. In keeping with the “localism” of growing hops just across the road from the brewery, Rupert and his team laid on a lunch in the dappling shade of the hop garden that featured almost entirely local produce: Surrey cheeses and breads, Surrey scotch eggs and pork pies, and so on, all very fine indeed. The only “outsiders” were a couple of dried meats from Cumbria, if I remember correctly, made by Rupert’s brother, which, too, were terrific. And now, a suitable musical ending from Shirley Collins and the Albion Band, “Hopping Down in Kent” – strictly the wrong county, but you’ll spot, I’m sure, that one of the pictures used in this YouTube video shows what is clearly a scene from Farnham. I’ve been invited on plenty of brewery visits over the years, but never before has the invite come with the request: “Please bring wellies and a spade.” This, however, was a field trip in a considerably more literal sense than normal: to the two and a half-acre field right opposite the Hogs Back brewery in Tongham, just outside Farnham in Surrey, to witness – and take part in – a historic event: the first planting of the Farnham White Bine hop variety in its native soil since the last bines were grubbed up 85 years ago. This is not just, however, a footnote in Farming Today magazine: this is, according to Hogs Back’s chairman, Rupert Thompson, an important step towards increasing the “localism” aspect of the brewery’s products. 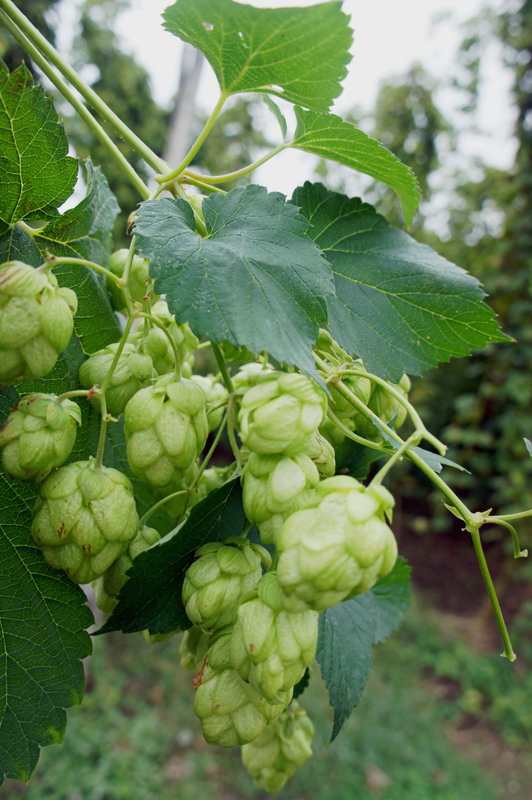 Once the new hop ground (the proper Surrey name for what elsewhere are called hop gardens or hop yards) is producing a healthy crop, those hops can then be used to flavour the beer being brewed just yards away: Surrey’s own hop variety, grown in Surrey, to produce Surrey beers. In 1886, Surrey had 2,937 acres of hop grounds: half the size of the Sussex hop crop and a third that of Hampshire, but more than either Hereford or Worcester. 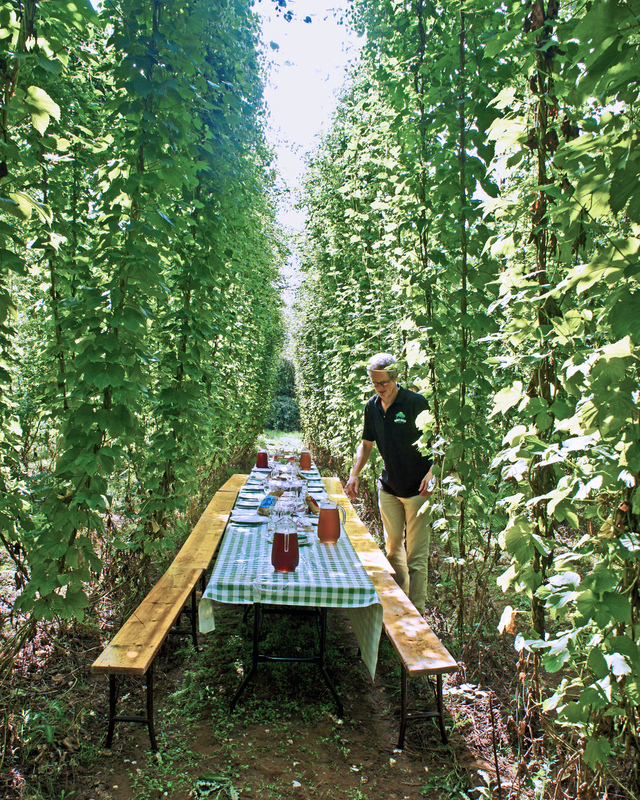 Disease – to which hops in general and Farnham White Bines in particular are prone, especially downy mildew – hammered the Surrey industry, and the county’s own hop disappeared from its homeland in 1929, to be replaced by more disease-resistant varieties. 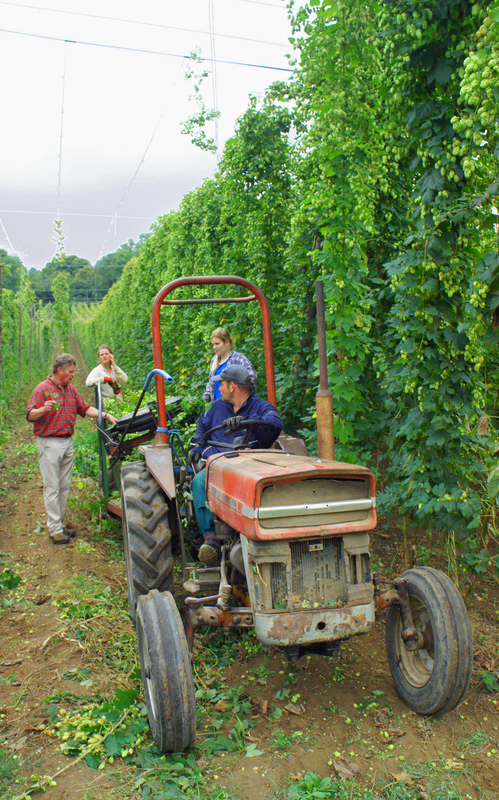 But even in 1959, there were still 1,879 acres of Surrey hop grounds, which made up 9.2% of all the land then given to hop cultivation in Britain. 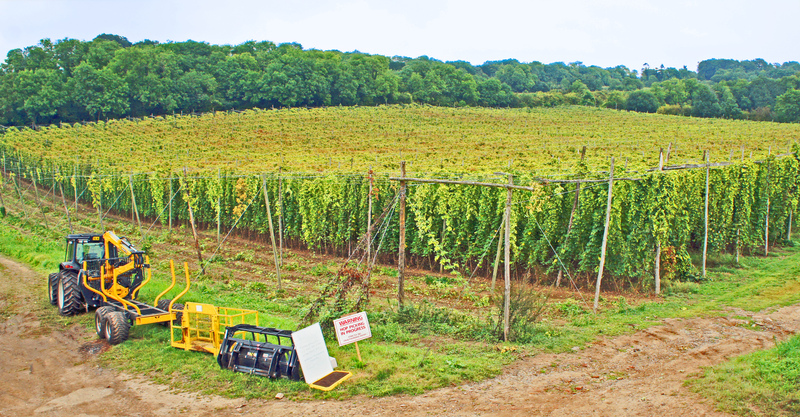 The collapse of the industry since that time is encapsulated in one telling statistic: the planting of hop bines at Tongham this week doubled the number of existing hop grounds in Surrey.